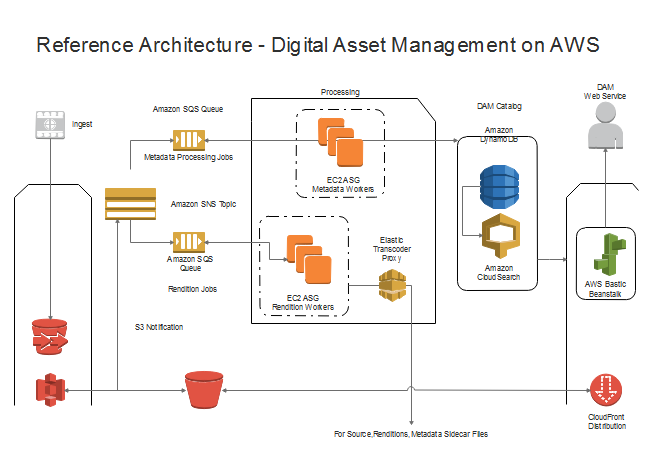 AWS architecture diagram can be easily generated with Edraw AWS diagram software. 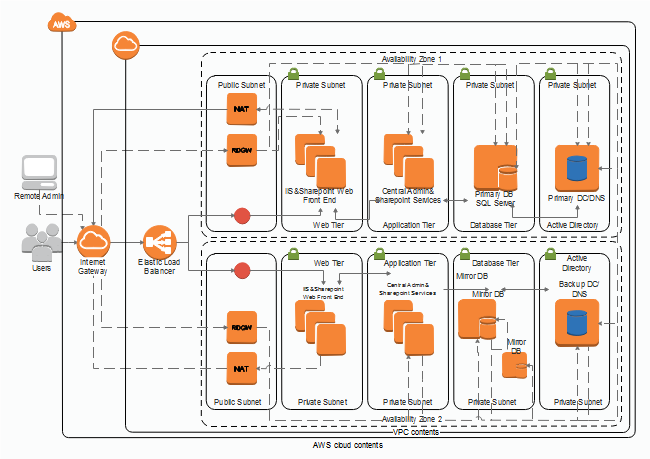 It includes standardized AWS icons and pre-start templates which help you produce high quality AWS architecture diagrams with minimum time loss. Amazon Web Service (AWS) is a cloud computing platform offered by Amazon.com. It provides a suite of cloud imputing that span a wide range including compute, storage, networking, database, analytics, application services, deployment, management, mobile, developer tools and tools for the internet. 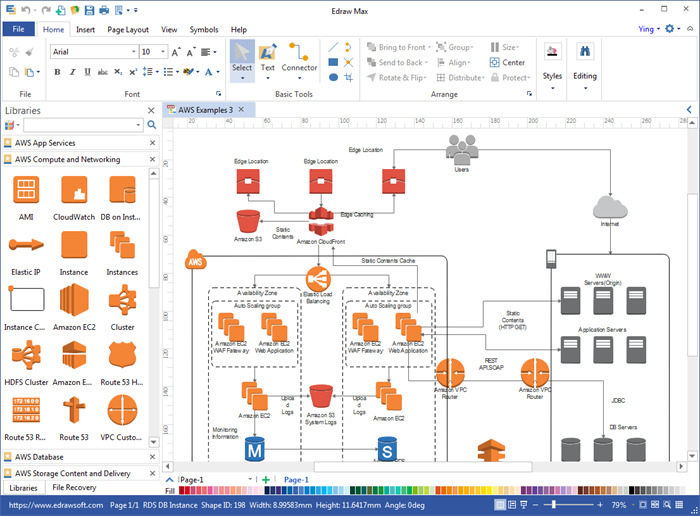 AWS Architecture diagram software provides you with the full set of AWS icons and an easy drag-and-drop drawing platform. System administrators and network professionals can map out AWS cloud infrastructure in seconds, without any drawing skill required. It facilitates precise drawing with advanced features such as "snap and glue", "auto spacing and alignment", and "grids and dynamic guides". Once finished, you can 1 click export the drawing to PDF, PPT, Word, Visio, PNG, etc. What's more, it supports big-size, complicated and multi-page drawings. Below is an overview of the AWS icons which are included in our pre-defined symbol library. The icons are divided into 8 different categories. You can load any library as you please and close those you don't need. They are vector icons that can be stretched or modified without quality loss. 1. It's a cross-platform based program which runs on Mac, Windows and Linux systems. 2. It's compatible with Microsoft Office and Visio. 3. It provides standardized and high-quality AWS icons. 4. Easy to use, support "drag and drop", "snap and glue", "auto alignment and spacing", etc. 5. It provides built-in templates to help you start quickly. 6. Easy to export your drawing to PNG, PDF, JPG, SVG, Visio, Word, PPT, Html, etc. 7. It supports WYSIWYG printing. 8. It supports large size and multi-page drawing. 9. Easy to add texts and manage text blocks. 10. Supports hyperlinks, attachments and notes. 11. It has free cloud space for saving files and cooperating with team members. 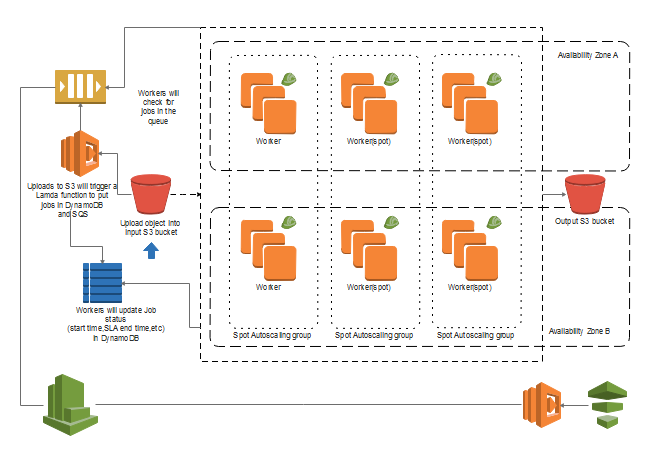 We present some AWS diagram templates below. Click the images to jump to another page from where you can download the editable and PDF files. The AWS architecture diagram is used to illustrate the network architecture. Use this AWS reference architecture diagram to communicate about network design, deployment and topology. 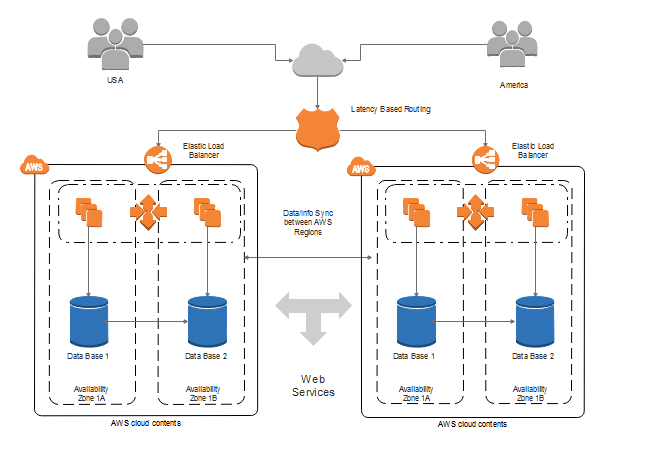 With our AWS architecture software, the AWS deployment architecture diagram below can be finished under half an hour. Diagram AWS cloud construction to present compute power, database storage, content delivery and other functionalities.